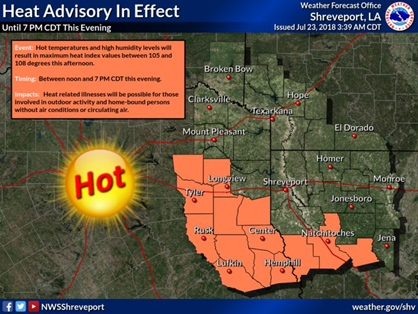 A Heat Advisory will be in effect for parts of East and Northeast Texas and Lower Northwest and North Central Louisiana from 12 PM CDT until 7 PM CDT generally to the South of a Quitman to Carthage, Texas, and Converse to Dry Prong and Pollock Louisiana line. From noon (12 PM CDT) until 7 PM CDT today. activities and home bound people without air conditioning or circulating air. Take extra precautions if you work or spend time outside. When possible, reschedule strenuous activities to early morning or evening. Know the signs and symptoms of heat exhaustion and heat stroke. Wear light weight and loose fitting clothing when possible and drink plenty of water. A Heat Advisory means that a period of hot temperatures is expected. The combination of hot temperatures and high humidity will combine to create a situation in which illnesses are possible. Drink plenty of fluids, stay in an air-conditioned room, stay out of the sun and check up on relatives, neighbors and the elderly.